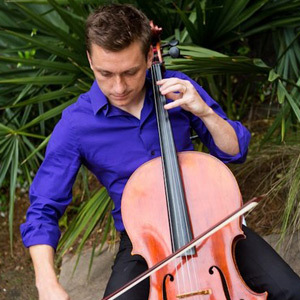 Andrew Mille began his cello studies in the USC Strings Project in Columbia S.C. at the age of eight. He played for both the South Carolina Youth Philharmonic Orchestra and All State Orchestra during his high school years, and in 2000 was awarded the Harry Lightsey Cello Scholarship to study at the College of Charleston, under the instruction of Damian Kremer of the Charleston Symphony. In the summers spanning from 2001 to 2004, Mille attended the Meadowmount School of Music in upstate New York, a school that claims such distinguished alumni such as Itzhak Perlman and Yo-Yo Ma. Upon completion of his bachelor’s degree in 2005, Mille studied with internationally renowned cellist Natalia Khoma as part of the College of Charleston’s graduate-level Artist Certificate program. Mille currently performs cello and taps South Carolina’s top local talent for private concerts, festivals, weddings and private events, through his Charleston-based company Entertainment Charleston, a network of professional musicians and performers. Entertainment Charleston is affiliated with the Charleston Visitors Bureau and is a member of the Charleston Area Travel Council, a network of leading businesses committed to ensuring Charleston’s continued success as one of the worlds top destination cities. Mille’s original company, Classical Charleston, now a branch of Entertainment Charleston, was the first organization of its kind, offering an extensive repertoire of classical music as well as pop and jazz, plus many possible ensemble variations. Only an idea a decade ago, Classical Charleston is now known for pushing the boundaries of what classical ensembles usually perform. In 2011, Mille and Classical Charleston’s lead violinist Tomas Jakubek invested in the creation of South Carolina’s first professional electric string quartet, the Acoustic Electric Quartet, also known as AEQ. The electric ensemble showcases music and unique arrangements of today’s most recognized pop tunes, classic jazz, popular classical works, all on flashy, modern Yamaha electric instruments. The Acoustic Electric Quartet has opened for private concerts by Michael Bolton, PGA Masters events in Augusta, Georgia, The Charleston International Film Festival as well as many other events across the Southeast. Visit EntertainmentCharleston.com to discover music performances for important, once-in-a-lifetime events.